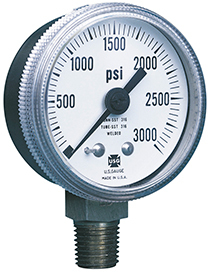 Utilizing a 300 Series stainless steel case, the Model 1535 pressure gauge is specially designed and ruggedly built to withstand corrosive atmospheres like salt air, sour gas, and many other industrial gasses. Available in both 2” and 2 ½” gauge sizes they are also in wide use in gauge regulators, gauge cabinets, and a host of other gas pressure applications. The Type 316L SST internal wetted surfaces make these gauges ideally suited for use with corrosive process media. The Model P1535 is available in pressure ranges from 30" Hg VAC-0 psi through 0-3000 psi. This precision pressure gauge incorporates rugged case construction with rear pressure relief, and a seamless Bourdon tube with welded joints for heavy duty service. A version designed for use in the semiconductor industry in also available.